In the Eucharist, Jesus gives Himself entirely to us, as we receive His Body and Blood. Through receiving Jesus' Body, we become more closely united to Him and to the entire Body of Christ and we are filled with food for the journey, so that we can better live out our Christian lives and grow in holiness. Children are required to receive two consecutive years of catechesis and sacramental preparation before receiving any sacraments. 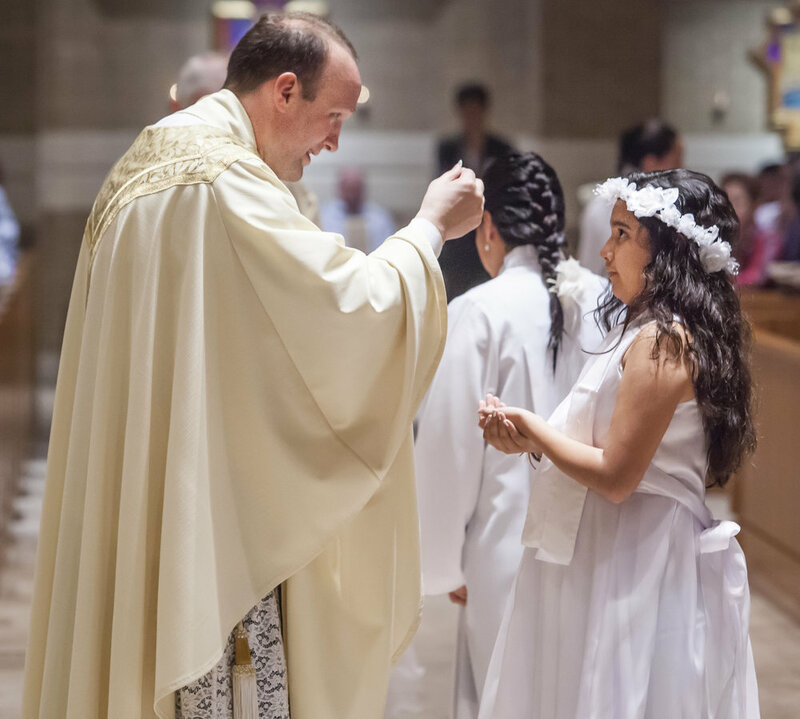 The normal course at St. Joseph is for children (who are baptized) to begin their preparation for 1st Reconciliation and 1st Holy Communion in the 1st grade and receive their sacraments in the 2nd grade. Students who have not received Holy Communion by the 2nd grade will be placed in an age appropriate sacramental prep class. Families can choose either Sunday 10:15am or Wednesday 6:15pm class times. Parents are required to attend parent meetings and two Saturday workshops. If your child is not yet baptized, you can find more information about having your child baptized here. Registration for Children's Faith Formation classes is open from April 15 to May 31 each year, with late registration (with a higher fee) going until June 30. If you would like to receive a reminder when our next registration opens, please submit the form below. Thank you! We will send you an email reminder when registration is opening.